The resettlement of the Lezghin people has facilitated their assimilation in Azerbaijan. Recently the topic about the eviction of the Lezghins from their ancestral lands to the steps of Kirghizia and Kazakhstan was raised in the website FLNKA. However, this was not the only case of Lezghins resettlement and squeezing them from their native lands. The practice of resettlement of the Lezghins was predominant during the entire pre-revolutionary and Soviet period. Unfortunately, the media hardly talked about this issue. The resettlement of mountaineers to the plain in the 50’s caused an enormous damage. All this was done to make life easier, to improve the social-economic and cultural development of the Highlanders. However, the relocation also had another underlying goal – the capture of foreign lands. Otherwise, how could one explain the fact that, following the resettlement of Lezghin mountaineers to the plain, the territories previously devoted for highland cattle were distributed to collective and State farms in other areas? In the past years Azerbaijan expanded its territory to the Rutul, Dokuzparinsky and Ahtynsk areas thus encompassing an additional 50000 hectares. In addition, after the forced relocation from Kurush in Khasavyurt District in 1956, a huge area of Kurush people was transferred to Azerbaijan. Now it is used as their own. In 1956 an enormous area of Kurush Lezghins was given to Azerbaijan after they were forcibly resettled in Khasavyurt District, anoher ethnic environment. It is rumored that Kabala city (former Kutkashen) is planned to be transformed to become the second capital of Azerbaijan. The city is actively being built, a new international airport will be operating soon. The area is gradually becoming one of the tourist centers: many health resorts have been built. About half of the inhabitants in Kabala are ethnic Lezghins. The high-level officials and their families acquire acres of land. Other persons and businessmen follow their example. The land problem is particularly acute in the Kabalinsky area because of the ethnic composition of its population. According to the last census in 1999, 16000 Lezghins or 17% lived there. Actually, there are 2-3 times more. Most residents have Lezghin roots, which many officials have acknowledged. There is only one preserved village in the region – Нидж, where 3.7 thousand or 4% of the Lezghins live. Active attempts to move the Lezghins to the plains date back to the 80’s. 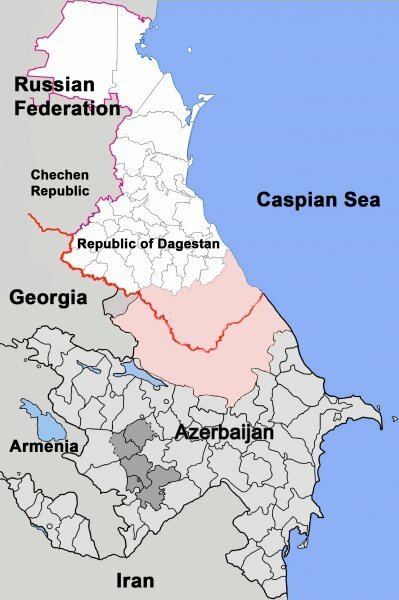 As the Lezghins do not have power in the region and financial capabilities, they are squeezed out from their territories. This purpose is reached in different ways: from the purchase of land to the illegal acquisitions. In the latter case, as it is practiced in Azerbaijan, the entire administrative apparatus is responsible for this. Even if it is against the law, all the necessary documents are prepared for the influential person; meanwhile Lezghin people are refused, also illegally, to register their own lands. If the people unite and try to assert their rights and to defend them, as happened in the Kyusnet village, they may face physical harm in response. A more difficult and “explosive” situation developed around four Lezghin "Eagle's Nest" villages: Kyusnet, Durudji, Kamervan and Laza. Military units are deployed in the last two villages (not nearby). In order to ensure the compact settlement of Lezghin people and despite the lack of land for local residents, Meskhetian Turks were moved and resettled on their lands before, and now Azeri Turks refugees. For example, in the regulation issued by the Security Council of Azerbaijan, it is clearly indicated where refugees from Karabakh have to be resettled. 9 out of 11 areas specified in the order are the areas where the Lezghins live. As the researchers point out, the relocation of Kryz (азерб. Qrızlar) to the Azerbaijan plains, which began even before the October Revolution, has led to the gradual loss of their ethnic identity, national traditions and language. The lack of even basic literacy and education in the mother tongue has facilitated this. Teaching is only in Azerbaijani. Most of Kryz inhabitants (especially those living outside the Sahdag zone) are bilingual. The native language, however, is mainly used only in the domestic sphere.